Sometimes as Christians we use terminology that isn't in the Bible. The word "discover," for example, is not a biblical term associated with spiritual gifts. Using terms not found in the Bible doesn't have to be a problem providing they are properly understood. And, the meaning cannot contradict the teaching of God's Word. 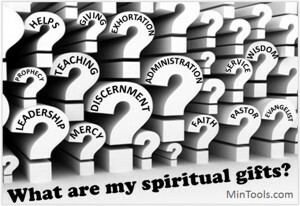 Let's therefore make sure we are biblically clear on what "discover your spiritual gifts" can and cannot mean. Discovering your gifts cannot mean that we determine what gifts we have. The Holy Spirit is the One who determines a person's gifts, not you or any other person. He distributes the gifts as He deems best. See 1 Corinthians 12:7-11. Since neither we nor any other human being chooses our gifts, we can then only be discovering them in the sense of finding out what gifts we might have already been given. Discovering your spiritual gifts can be no more than the process identifying or learning what they might be ... putting a label on that which has already been given to us by the Spirit.